President Donald Trump’s trade policy could take a major bite out of the US economy, according to a new report. The report, commissioned by the pro-free-trade Koch Industries, modelled the impact if Trump were to go through with all of his tariff threats on China and auto imports. The report also assumed other countries would respond in kind. The report found that gross domestic product, household income, and industrial production would fall substantially and that unemployment would rise. President Donald Trump’s trade policy could cost American households thousands of dollars next year, according to a study released Tuesday. 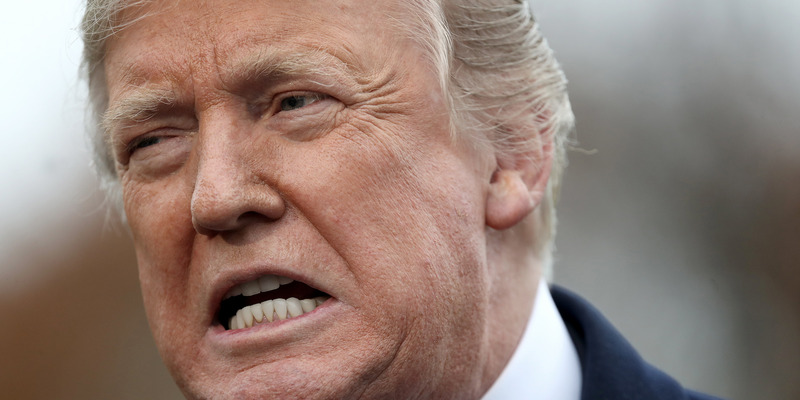 The report, authored by Terrie Walmsley and Peter Minor and sponsored by the pro-free-trade Koch Industries, concluded that Trump’s threats to boost tariffs on Chinese products, impose tariffs on auto imports, and continue tariffs on steel and aluminium could take a major chunk out of the economy. The reasoning behind the economic slowdown is fairly simple. Tariffs act as taxes on goods coming into the US, making items hit with the restrictions more expensive. While this makes US-made goods cheaper by comparison, it also drives up costs for American businesses and consumers. In response to the higher prices, businesses and consumers could buy less, resulting in a slower pace of job growth, less capital investment, and eventually slower economic activity. While the researchers’ estimates don’t suggest the US would be plunged into a recession, they say the slowdown would be substantial. 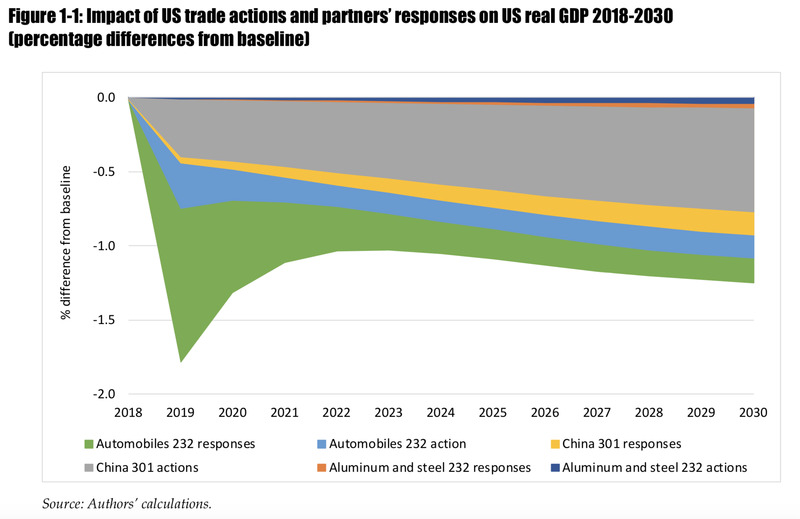 ImpactEconEstimates for the amount of economic growth each trade action — auto tariffs, China tariffs, and metals tariffs — would shave off gross domestic product through 2030. The total economic cost from the measures from 2018 to 2030 would be $US2.8 trillion. Gross domestic product in 2019 would be 1.78 percentage points lower in 2019 than under the current projection. In 2019, each US household would lose the equivalent of $US2,357, which also works out to a cost of about $US915 a person. Through 2030, the study estimates that each household would lose just over $US17,000 in spending power. If all trade actions hit concurrently, up to 2.75 million more workers would be unemployed compared with current projections, as companies slow their hiring plans and lay off workers. The authors also estimate that the trade policies would force 665,000 workers to find employment in other industries. Not all of the trade policies modelled in the study have come to pass. But Trump has recently suggested that many of those scenarios could soon become a reality. For instance, the president told The Wall Street Journal in an interview on Monday that it was “highly unlikely” that the US and China would reach a deal to avoid an increase of the tariff rate on $US200 billion worth of Chinese goods to 25% from 10% come January 1. Trump has also made more noise regarding the potential imposition of auto tariffs in recent weeks. Officials from the European Union and other major partners have warned that retaliation similar to what Walmsley and Minor modelled could become a reality if the president were to go through with those threats. The authors’ findings line up with other studies that have shown the trade war could harm US economic growth, increase the number of jobless, and cause prices to rise. Trump is set to meet with Chinese President Xi Jinping at the G20 summit this weekend in a meeting that could set the stage for the trade war’s path ahead.